and all watched over by machines of loving grace is an interactive video installation using a computer, software, large monitors and a sensor. Two large monitors display human eyes. 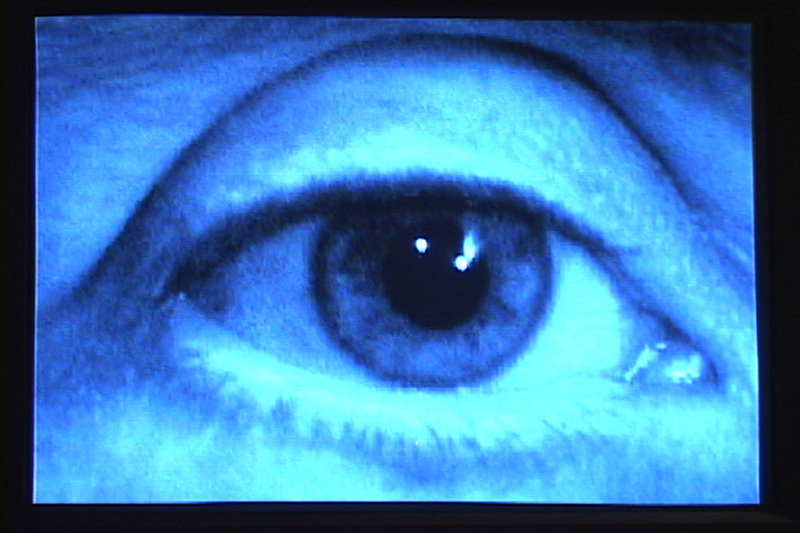 As the viewer walks past the monitor, the eyes follow their motion. The screens “watch” the viewer, and track their motions. In an adjacent area, a video loop plays of an extreme close-up of an eye that blinks in slow motion. This aspect of the installation emphasizes the human element of surveillance—a blink—that implies an inherent failure if compared to machine surveillance. The title comes from a 1967 Richard Brautigan poem, and suggests a loving, caring gaze that watches over humanity, as opposed to the current state of surveillance that is concerned with property crime and consumerism. Donna Szoke is a Canadian media artist whose practice includes video, animation, writing, installation, and collaboration. Her work has shown in Canada, US, France, Germany, Hungary, Croatia and Turkey. Her work exhibits in public art, interactive video installation, outdoor site-speciﬁc video installation, ﬁlm festivals, theatre and dance. She has received numerous research awards and grants for her work, including SSHRC, BCAC, OAC and Canada Council for the Arts. She holds a BA, BFA and MFA and is currently a Visiting Artist / Assistant Professor at Brock University in the Marilyn I. Walker School of Fine and Performing Arts. Ricarda McDonald is a Canadian artist whose practice includes computer-manipulated photography, video, sound, light and computer-mediated installations and collaboration. In 2011, Ricarda built a theremin and became one of the founding members of the Vancouver Experimental Theremin Orchestra (VETO). VETO performed at Xenakis: Vancouver New Music Festival 2011 and at the Interactive Futures ’11: Animal Inﬂuence Conference held at ECUAD. She holds a BFA from the Emily Carr University of Art + Design, a BMATH from the University of Waterloo and is a graduate of the National Ballet School of Canada.